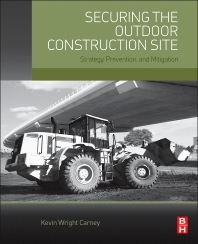 Securing the Outdoor Construction Site: Strategy, Prevention, and Mitigation offers a holistic view of security planning for vulnerable capital projects, providing the strategic and tactical plans needed to protect large areas with a minimum investment in personnel and equipment. This book is a one-stop reference that provides effective security strategies, methods, and tactics to mitigate the theft of equipment and how to avoid these incidents altogether. In addition, the book outlines the true costs of construction site theft to organizations in terms of lost time, equipment, and brand reputation, along with increased insurance premiums and danger to personnel. It lists the types of theft that regularly occur at sites, explores their underlying causes, and documents their worldwide financial significance. Finally, readers will learn how to conduct a construction site survey with loss prevention in mind, and how to budget for the unexpected. Chapter 2. What Is Being Stolen?